Today’s 21 day meditation challenge was focused on compassion. Especially because today is Vegan (Feast) Thursday, please extend your compassion to animals as well as people. Considering some plant-based options for your meals today will show compassion towards both! Thanks everyone who continues to vote and share the SilverSneakers link for Charlotte….Much appreciated….and Much love……..
Just One More Week for This and That, Too…. 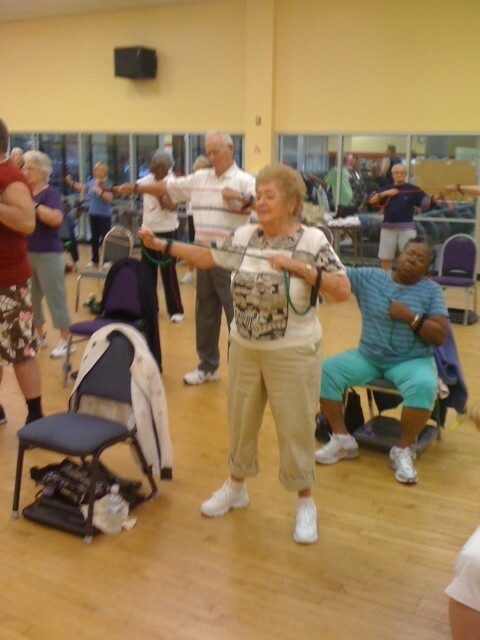 So I got a call from Elizabeth at Healthways (who owns SilverSneakers) late last week to let me know that the company will be coming out to Tamarac Fitness Center to make a light luncheon party in honor of Charlotte. I honestly don’t know if this is being done for all 10 candidates or because Charlotte is such a close second. This event will be on Monday September 22nd at 12:30, immediately following class. If you are a SilverSneakers student at TFC, please mark your calendar and come out to socialize and honor this wonderful woman. While she continues to be many votes behind Grace, from Arizona, she continues to be many, many votes ahead of the other 8 nominees for the Swanson Award. We still have a week to vote, once every day, so if you are on Facebook, please continue to go to the SilverSneakers page and cast your vote for her. Thank you to EVERYONE who has helped her earn almost 1000 votes as of this morning. I am totally impressed and warmed by how many of my friends on Facebook have gone out of their way, each and every day this month, not just to vote, but to spread the word to their Facebook network and encourage them to vote as well. You have all made a huge difference in the outcome and I appreciate each and every one of you and your efforts. I know this celebration in Charlotte’s honor is going to mean a lot to her. How many 95 year old’s get to be celebrated for anything other than a birthday? Think about it….. I haven’t been blogging much — I have been spending my blogging time doing the 21 day meditation challenge along with Mitch…and Roxbury (the cat) who purrs without pause as she lies in savasana. I would video it, except she really just lies there–but it is quite obvious how soothing it is for any living thing!….Anyway, today is day 15 and that means we have just one more week…Interestingly enough, Mitch and I did our daily meditation at the beach yesterday and had the exact same experience (thinking we might have dozed off and then forgetting what the mantra was). One thing I have learned about meditation is that however it turns out, it was exactly what was needed at that time. No judgement. No good meditations or bad meditations…Hoping we will be able to continue to keep a routine once this one is over. It’s the third time I am doing the 21 day challenge and it just gets better each time. Since I got up extra early this morning, I thought I would check in, but time is up so I just want to wish you all an easy yet productive Monday. I will be doing a lot of subbing later this week and next, so I will keep you (the SilverSneakers students) posted. For this week, I will be subbing Thursday and Friday at 10 along with my regular classes. There will be no 8:30 am class this (or next) Friday. Slaying the Protein Myth….I Love This Article…. Found this article in the Forks Over Knives newsletter this morning and just had to share… Know way I could have said this so well…..I was too busy sorting through wedding pics yesterday (they came out sooooooooo good) and missed blogging about Vegan Thursday…Please take the time to read this and consider your nutritional choices today….Thanks and don’t forget to vote for Charlotte in the SilverSneakers Award competition on Facebook. I am plant-based. Essentially, this means I don’t eat anything with a face or a mother. Animals find this agreeable. I’m also an ultra-endurance athlete. Essentially, this means I don’t go all that fast, but I can go all day. My wife finds this agreeable. Conventional wisdom is that “vegan” and “athlete” simply don’t get along — let’s call it irreconcilable differences. I’m here to say that is utter nonsense. Not a day goes by that I am not asked this question. If I had a dollar for every time this came up, everyone in my family would be driving a Tesla. Most vegans bristle at the question. Armed for battle, they assume a defensive position and hunker down for the inevitable, age-old omnivore versus herbivore fight that always ensues. Because belief systems around food are entrenched — they’re right up there with religion and politics — emotions run high. Before you can blink, arrows are flying in both directions. Conversation becomes debate. And debate all too often devolves into mudslinging … an endless, hopelessly unproductive merry-go-round that leaves each side further entrenched in their preferred dogma and never leads anywhere constructive. I hate that — it’s why a large portion of the general public finds vegans so unpalatable. Instead, I welcome the question. If someone is asking, I presume a genuine interest — simply an opportunity for a productive dialog. So let’s try to have that dialog. The productive kind. My perspective on the elephant in the room … nothing more, nothing less. We live in a society in which we have been willfully misled to believe that meat and dairy products are the sole source of dietary protein worthy of merit. Without copious amounts of animal protein, it’s impossible to be healthy, let alone perform as an athlete. The message is everywhere, from a recent (and wildly successful I might add) high-profile dairy lobby ad campaign pushing chocolate milk as the ultimate athletic recovery beverage (diabolically genius), to compelling food labels, to a dizzying array of fitness expert testimonials. Protein, protein, protein — generally reinforced with the adage that more is better. Whether you are a professional athlete or a couch potato, this hardened notion is so deeply ingrained into our collective belief system that to challenge its propriety is nothing short of heresy. But through direct experience, I have come to believe that this pervasive notion is at best misleading, if not altogether utterly false … fueled by a well-funded campaign of disinformation perpetuated by powerful and well-funded Big Food, Big Ag, and industrial animal agriculture interests that have spent countless marketing dollars to convince society that we absolutely need these products in order to continue breathing air in and out of our lungs. The animal protein push is not only based on lies, it’s killing us, luring us to feast on a rotunda of factory-farmed, hormone- and pesticide-laden, low-fiber foods extremely high in saturated fat. Eating this way, I remain convinced (despite the current populist fervor over high-fat, low-carb diets), is indeed a contributing factor to our epidemic of heart disease (the world’s #1 killer) and many other lifestyle-induced infirmities that have rendered our prosperous nation one of the sickest societies on Earth. Indeed, protein is an essential nutrient, absolutely critical not just in building and repairing muscle tissue, but in the maintenance of a wide array of important bodily functions. But does it matter if our protein comes from plants rather than animals? And how much do we actually need? Proteins consist of twenty different amino acids, eleven of which can be synthesized naturally by our bodies. The remaining nine — what we call essential amino acids — must be ingested from the foods we eat. So technically, our bodies require certain amino acids, not protein per se. But these nine essential amino acids are hardly the exclusive domain of the animal kingdom. In fact, they’re originally synthesized by plants and are found in meat and dairy products only because these animals have eaten plants. Despite the “butter is back” hysteria that recently graced the cover of TIME magazine, the best medical science establishes beyond reproach that both casein and whey contribute materially to degenerative disease. A family of proteins found in milk, casein has been linked to the onset of a variety of diseases, including cancer. And whey is nothing more than a highly processed, low-grade discard of cheese production — another diabolical stroke of genius courtesy of the dairy industry that created a zillion-dollar business out of stuff previously tossed in the garbage. On a personal anecdotal level, adopting a plant-based lifestyle eight years ago repaired my health wholesale and revitalized my middle-aged self to reengage fitness in a new way. As hard as it may be for some to believe, the truth is that my athletic accomplishments were achieved not in spite of my dietary shift but rather as direct result of adopting this new way of eating and living. Just ask Oakland Raiders defensive tackle David Carter. Watch this video of strongman Patrik Baboumian breaking a world record for most weight carried by a human being when he hauled over 1200 pounds — roughly the weight of a Smart Car — 10 meters across a stage in Toronto last year. Witness two-time World Champion Freerunner and parkour artist Timothy Shieff hopscotching off rooftops like a video game character. And be amazed by this video of plant-based strength athlete freak-of-nature Frank Medrano doing things with his body you didn’t think possible. Then there are MMA/UFC fighters like Mac Danzig, Jake Shields, and James Wilks. And multisport athletes like Brendan Brazier, Rip Esselstyn, and Ben Bostrom — a world-renowned motorcycle, mountain bike, and road bike athlete & victorious member of this year’s Race Across America 4-man relay team. Also professional triathlete & Ultraman World Champion Hillary Biscay who just raced her 66th Ironman. Check out ultramarathoners extraordinaire like Scott Jurek, his fruitarian compadre Michael Arnstein, and my old friend Jason Lester, with whom I completed 5 Ironman distance triathlons on 5 Hawaiian islands in under a week. Jason has since criss-crossed the USA on two feet and is currently prepping for a 100-day run across China. Then of course there is Timothy Bradley, Jr., who took down Manny Pacquiao last year (well kind of, but you get my drift). The point is this: each of these athletes, and countless others, will all tell you the same thing: rather than steak, milk, eggs, and whey supplements, opt instead to eat lower on the food chain and source your protein needs from healthy plant-based sources like black, kidney, pinto, and other beans, almonds, lentils, hemp seeds, spirulina, and quinoa. Even eating less-concentrated sources of protein like potatoes, sweet potatoes, and bananas will get you exactly where you need to be. If you ate nothing but a variety of fresh fruit, you still would never suffer a deficiency of protein (or even any particular amino acid). Short of starving yourself, it’s almost impossible. Despite the incredibly heavy tax I impose on my body, training at times upwards of 25 hours per week for ultra-endurance events, this type of regimen has fueled me for years, without any issues with respect to building lean muscle mass. In reality, I believe that eating plant-based has significantly enhanced my ability to expedite physiological recovery between workouts — the holy grail of athletic performance enhancement. In fact, I can honestly say that at age 47 I am fitter than I have ever been, even when I was a world-class-level competition swimmer at Stanford in the late 1980s. And despite what you might have been told, I submit that more protein isn’t better. Satisfy your requirement and leave it at that. With respect to athletes, to my knowledge no scientific study has ever shown that consumption of protein beyond the RDA-advised minimum (10 percent of daily calories) stimulates additional muscle growth or expedites physiological repair induced by exercise stress. And yet most people — the overwhelming majority of whom are predominantly sedentary — generally consume upwards of three times the amount of daily protein required to thrive. The protein craze isn’t just an unwarranted, over-hyped red herring, it’s harmful. Not only is there evidence that excess protein intake is often stored in fat cells, it contributes to the onset of a variety of diseases, such as osteoporosis, cancer, impaired kidney function, and heart disease. Still not convinced? Consider this: some of the fiercest animals in the world — the elephant, rhino, hippo and gorilla — are Plantpowered herbivores. And nobody asks them where they get their protein. So ditch that steak and join me for a bowl of quinoa and lentils. A graduate of Stanford University and Cornell Law School, Rich Roll is an author, world-renowned ultra-endurance athlete, a wellness advocate, husband, and father, and an inspiration to people worldwide as an example of courageous and healthy living. He is the first of two people to complete five Ironman triathlons on five Hawaiian islands in under a week. Visit RichRoll.com to receive updates and learn more about his book, Finding Ultra. Getting to the Heart of (Muscle) Things…. Yesterday I took the ice bucket challenge and today Mitch will do the same. Today I will also make a donation to the ALS foundation. It is no coincidence that I once worked in an organization that helped raise money for diseased muscles and ever since have worked with helping people make their muscles stronger. I will NEVER take for granted my healthy muscles and I will push them to their limit, because I can, but will always be sympathetic towards those that can’t. No matter how hard we work at our Facebook voting, Charlotte remains in second place. I am frustrated but know that we will celebrate and honor her regardless of the outcome. Continue to vote daily and continue to spread the word. You never know what can happen in the next 11 days! Remember, if you are local and want to come take or renew your CPR and AED you can join Ellen and I as we renew ours on Thursday September 18th at 11am at Tamarac Fitness Center, for a 40.00 fee. You will receive certification cards through the American Heart Association. The hope is that we never have to use our knowledge, but in case we do, we’ll be ready….and let’s face it, our hearts are the most important muscle we have! Last night on Jeopardy, a clue had to do with a blog being an online diary. It sort of made me uncomfortable. I always aimed to help people by blogging, but often think it comes across totally self-indulgent. That makes me very uncomfortable and I will have to give a lot of thought to that moving forward. If you are participating in the 21 day meditation challenge, today is all about being purposeful as it impacts happiness. So my wish for you today is to have a highly purposeful day! Namaste. No matter how old I get, and how long I (and my kids!) am done with school, I will always get “butterflies” on the first day back. Good luck to all the teachers and students embarking on a new school year, starting today. It’s a good day for all of us to consider starting a new, learning something new, setting a new goal or taking on a new challenge. Kyle accepted the ice bucket challenge to raise money for ALS and today, I will accept his challenge to me. You may be next! Remember that regardless of whether you accept the challenge or not, a donation to the ALS organization is still in order. As the challenge spreads like wildfire, let us remember the purpose! If you aren’t familiar with how devastating this disease is, read up on Lou Gehrig, or read the book Tuesdays with Morrie, by Mitch Albom, which was, in my opinion the best of his books, by far. Thanks to everyone who continues to vote for Charlotte. She has slipped way behind the first place holder, Grace….by about 50 votes. I don’t know what else to do so please vote and tell everyone you know to do the same. Thank you so much………..
Breakfast for Dinner and Your Daily Reminder to Vote for Charlotte!!! Whenever I eat a high carb dinner, I feel real good about getting out on the street and running, so I will do that this morning. In fact, since it’s one of the last Fridays of my summer schedule, I plan to run and swim before going to teach this morning. This quote came in my quote of the day yesterday and I thought it was worth sharing. If you aren’t feeling as good as you would like to, you might want to consider this. There is nothing like the feeling of accomplishment after you have put in the effort! Before I log out and sit for day 5 of the meditation challenge, I have to say that I am overwhelmed with the generosity of spirit regarding the SilverSneakers challenge and all of you that have voted and continued to vote each day. Thank you so much for sharing your status and asking others to vote as well. I no longer recognize the names of the friends of the friends of the friends who have shared my status in asking others to vote. This morning Charlotte is only about 20 votes behind the first place holder, Grace, and I feel together we can move this amazing woman into the first place spot. If she wins there will be a party in her honor and I am sure her face will be on a lot of promotional material. Additionally there will be some equipment gifted to the gym for us but above all, Charlotte will be recognized. She has done so much fundraising and volunteering in her life and this recognition would be a great way to give back to her for all she has given to the world. Plus I just love her…………. I am thankful every single day that I live in a country that still allows me choices. The below photo shows just one more reason I choose animals as my friends, not my nutrition. Koko’s handlers took this photo of the gorilla reacting to the news of Robin Williams’ death. 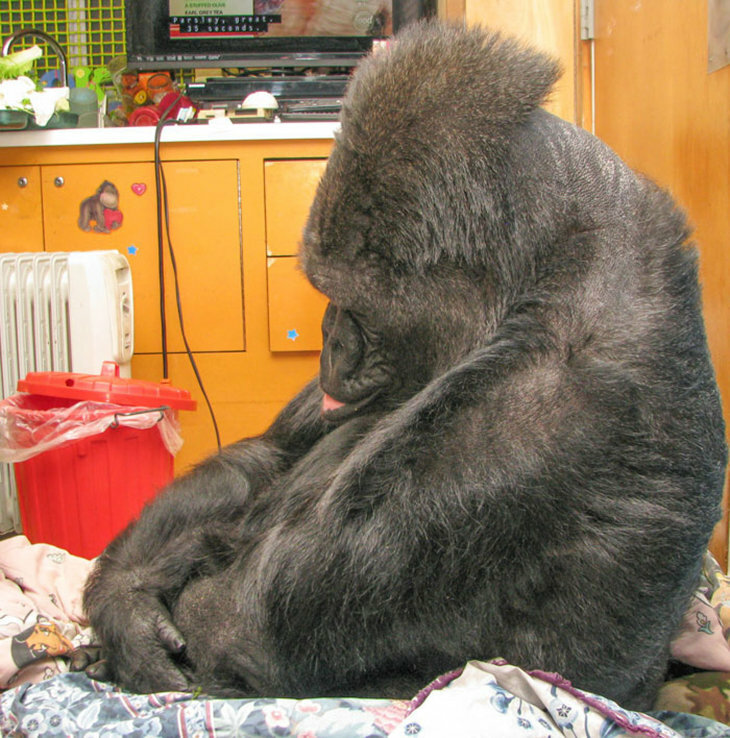 “Koko became very somber, with her head bowed and her lip quivering,” they said. Thanks for continuing to vote for Charlotte on Facebook. There is so much to say about this woman. I have better conversations (about EVERYTHING) with this woman than I do with many of my own peers. She is funny, loving, caring, giving, smart, open-minded and so much more. She only comes to class 2x a week because there is so much else to do. From helping kids with life skills and meditation, to hitting the casinos, creating the most intricate and gorgeous needlepoint pieces and of course spending time with friends and her family including her great grandchildren who she RUNS around with…this 95 year young woman is a phenom. So keep the votes coming! She’s nudging her way up to second place this morning. GO VOTE via the SilverSneakers Facebook page. Do it every day until we turn the calendar to September. Thanks so much to all who are doing this daily and also for those sharing their status about it. I am so appreciative………….. In Honor and In Memory………. I thought blogging would be put aside for a few weeks, but today I have a favor to ask and info to share and Mitch and I already did our day 2 meditation so…. 1) My student Charlotte, from SilverSneakers class, is in the running for an recognition given yearly. Along with the rest of the class, we nominated her for all she brings to us each day, and all she has given to the world in her 95 years (though she likes to flip those numbers and call herself 59 right now). Yesterday, I found out that Facebook voters will decide who wins, so please, please, if you are on Facebook can you go to the SilverSneakers page, like it, and then scroll down to the entry about the Swanson Award, and click the box to vote for her. We are allowed to vote every day, until the last day of August, so I warn you that I will be reminding you daily. It’s not for me…it’s all for her! If you follow my blog you have already read about what an inspiration this woman is. If you are in class, you know by being with her. This morning she is in third place so let’s see what we can do to move her to, and keep her in, the numero uno spot! 2) I am organizing a CPR/AED certification at Tamarac Fitness Center on Thursday September 18 at 11. If you are an instructor in need of renewal, of in need of CPR or renewal for any job, this is the one you need and will get your card a few days after, by mail. If you have never taken CPR, why not come out and join us. The life you save will probably be a loved one, as that’s how the stats roll. Let me know if you are interested and/or if you need directions. Nicole Goldstein will be our instructor. So sad to learn about the passing of Robin Williams aka Mork from Ork. My memories of his first character are so vivid and all good. There was always a message at the end, as he reported back to his boss about what he learned on earth and in all the humor, the message was always meaningful. Robin Williams sure made some huge contributions to our planet in his lifetime and it saddens us all that someone like himself could have still been struggling to find happiness…the tears of a clown are the saddest tears of all. Let us honor his life by expanding our own happiness. Much love…..and I bid you a…nanu nanu, of course! Good morning and welcome to a new week. To those heading back to work/school this morning, I wish you all a productive and peaceful year. I will be learning more about expanding my happiness, as I tune into my first of 21 days of meditation. I will be trading in most of my blogging time over the next 3 weeks so that I can do the meditations in the early morning, when I find it easiest to sit, and something to reflect on all day, so don’t be surprised if you don’t find me blogging too much over the next 3 weeks. What a beautiful day at the beach yesterday. It’s hard to believe ANYTHING can bring more peace or happiness than a few hours playing in that beautiful ocean. I pointed out to Mitch that next week when we go we can do our daily meditation there. That’s heaven on earth. I am back to a regular schedule this week and am ready! Kids are back from their honeymoon and I have to think they are anything BUT ready to return to reality, but they do go back to their office as Mr. and Mrs. which is pretty awesome! Wishing you expanding happiness and a wonderful Monday. Getting Back to Business…Hearts, Love and Happiness….. I had been putting off so many things until after the wedding, and now that time is here. It was back to work for me on Wednesday and additionally, I have completed 2 home study courses and narrowed down a couple of days that would be great for CPR renewal. I have located someone who will come to the gym to do our CPR training and after I get with Ellen on Monday I will narrow it down to which Wednesday or Thursday afternoon we will do this. If you are local and reading this and need or want CPR/AED training (renewal or first timers) let me know. I will also post something at the gym once we have a definite date. I will be at the gym this morning for our regularly scheduled Saturday morning class. Thinking 20 minutes cardio, 15 weights, 10 yoga, 5 abs and then stretching, so if you are coming to class think along those lines. Remember that the 21 day meditation begins Monday. I am sure you can go to chopracentermeditation.com to register. This time the topic is expanding your happiness, and since happiness is EVERYTHING who wouldn’t want to expand theirs?